Most plant leaves are green because they contain chlorophyll. The chlorophyll changes light into energy for the plant. Shades of green range from very light and bright, such as that found in the acid green leaves of lady's mantle to the nearly black dark-green hue found in taro leaves. Some plants have leaves that include all three colors of red, yellow and green in one plant. Others change from green to red and yellow, and finally, still others have two-tone leaves (green and yellow, or green and red). Croton is a houseplant that is good for most areas of the country. It originated in the tropics including Java and the South Seas. In the wild, the plant grows to 10 feet. The leaves have various shapes. One of the most common is the oak leaf croton. The leaves are shaped like typically oak leaves but are much bigger: up to 8 inches long and 4 inches wide. Leaves may be mostly red, yellow or green or a combination of all three colors. Coleus is an annual that prefers a shady spot outside. It grows well in containers on patios and balconies. It has unimpressive small flowers. Leaves are brilliantly colored in shades of red, yellow and green as well as pink and purple. Plant size ranges from 12 inches to 36 inches. Keep the growing tips pinched to produce a bushy plant. Cannas are grown for their brightly colored flowers that look like gladioli on steroids. Most of the types have green, broad leaves that unwrap around a central stem that's from 36 to 48 inches tall. 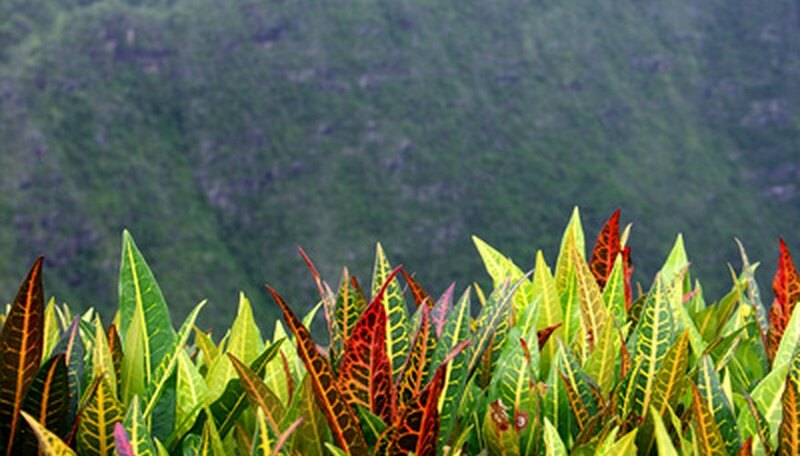 Variegated leaves on some of the types of canna incorporate red and yellow colors. Tropicana is one of those. These plants are tropical and must be lifted and stored indoors to survive cold winters. The Japanese maple is a specimen tree that grows to 15 to 25 feet tall and easily takes to pruning. It's often used in bonsai. The tree is green through spring and summer and turns yellow blending into red during the fall. Chard is usually a green vegetable with leaves from 4 to 10 inches tall and 3 to 6 inches broad on thick stems. Bright lights chard has the same growth habit but the stems and veins are yellow, red and white. Chard is a bit too tough to eat raw in salads even when the leaves are young. Cook it as you would spinach.